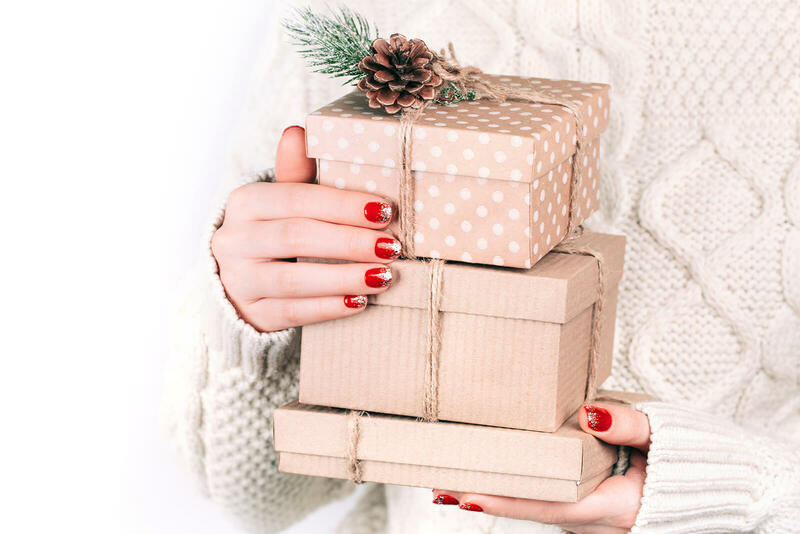 Relax, I’ve got the perfect keto gift ideas for your friend or family member that follows a low carb diet! 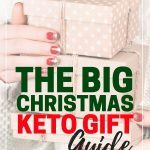 From keto friendly stocking stuffers to low carb snacks and keto gift basket ideas. From the best BIG impressive kitchen tools to funny keto gift ideas, this gift guide covers it all. Choosing gifts for keto friends and family when you’re not keto is a huge challenge. There are so many foods and treats labeled as keto and low carb friendly that just plain aren’t! And while some kitchen appliances and tools become more useful after going keto, some are obsolete. 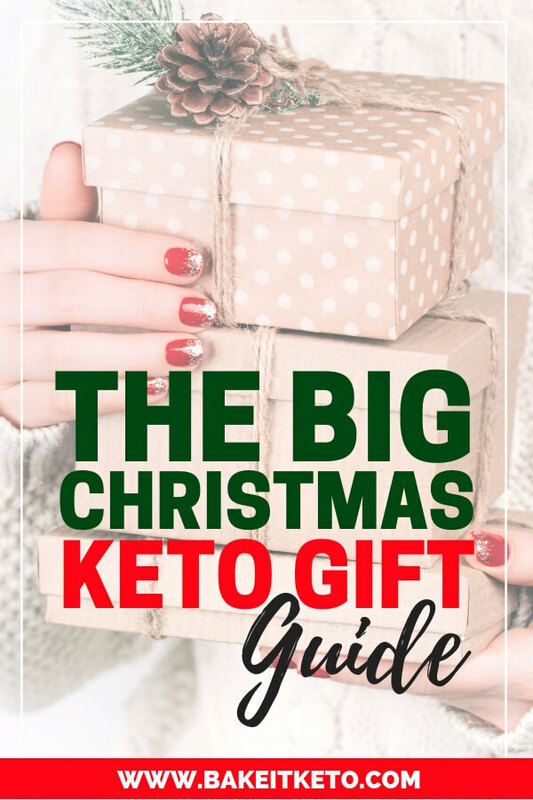 In this keto gift guide, I’m sharing all of the best keto and low carb gift ideas. You’ll find delicious snacks and treats for keto Christmas stocking stuffers, gift baskets, and care packages. I’ve also included the best appliance and kitchen tool gifts for low carb dieters, whatever your budget. Eliot’s Adult Nut Butters has the most delicious keto friendly nut butter flavors. My picks: Espresso Nib Peanut Butter, Chocolate Chili Almond Butter, Garam Masala Peanut Butter, or Spicy Thai Peanut Butter. Hepp’s Salt Co makes THE BEST flavored sea salts. My absolute favorite is Hepp’s Roasted Garlic Sea Salt, followed closely by their smoked salts like the Alderwood Smoked Sea Salt. If you are shopping for someone who loves spicy food, they will love the Ghost Pepper Sea Salt. Primal Palate Spices are the perfect stocking stuffers for the keto cook. You can’t go wrong with any of the most popular savory blends, like the Taco Seasoning, Steak Seasoning, Adobo Seasoning, or Meat & Potatoes Seasoning. Sweet Leaf Stevia makes flavored stevia drops that actually taste good! I always keep a few on hand for when I get a craving for a tasty coffeehouse-style drink. I love the English Toffee, Vanilla Creme, Pumpkin Spice, and Chocolate. Lily’s is one of the few commercially produced chocolates that is truly keto and low carb friendly (without malitol or other sneaky blood sugar spikers). Lily’s Original Dark Chocolate Bar is a perfect stocking stuffer for keto and low carb eaters with a sweet tooth! An oven thermometer is super important for successful low carb baking. Most home ovens run much hotter or colder than their dial indicates! Keto baking involves many new, expensive ingredients – you definitely want to avoid the frustration of unknowingly baking at the wrong temperature! You probably already know my love for offset spatulas! This is the pro tool that every home baker should add to their kitchen drawer. My favorites are the Ateco Ultra Offset Spatulas. I recommend getting the Ateco 7.75” and the Ateco 4.25” (each under $10), or for under $20 buy the set of three, which includes the 4.25″, 7.75″, and the 9.75”. For many people, starting the keto diet means truly learning to cook whole foods for the first time. A good peeler can make all the difference when it’s time to do the dreaded task of meal prep! In our kitchen, we use and recommend the OXO Good Grips Swivel Peeler, and it makes a perfect stocking stuffer for anyone on a keto diet. Silicone Muffin Pans are essential for keto and low carb baking. They’re ideal for baking things without paper liners, like egg cups or mini cheesecakes. Pro tip: If you’re baking something delicate like mini cheesecakes, put the entire pan of finished and cooled cheesecakes into the freezer. Once hard, use the flexible silicone pan to pop each one out! Silicone muffin pans are also fantastic for freezing small portions of homemade or leftover bone broth, tomato sauce, pesto, and almost anything else you can think of! I’m pretty darn sure this is the deal of the century! I’ve been a huge fan of Silpat silicone baking mats ever since I was in culinary school, but they are usually super expensive. Whether you’re making keto cheese chips or low carb cookies, absolutely nothing will stick to these. I have heard such great things about these Amazon Basics silicone baking mats that they are definitely going under our tree this Christmas! When I need a delicious, keto friendly road trip snack, I always grab some Moon Cheese! I love that they don’t add any extra starches like a lot of other products masquerading as low carb. This four bag variety pack includes Cheddar, Gouda, Pepperjack, and Mozzarella. Whether you’re buying keto gifts for a mom who is eating keto, or you’re a mom that fills your own stocking, this mug is the perfect gift under $20. We all know that keto moms run on coffee, after all! Pili Nuts are the darling of the keto and low carb world, and for good reason! They’re a great source of magnesium and are the lowest carb nut. They have an indescribably buttery flavor. You must try these! This Pili Hunters’ variety pack includes both Original and Spicy Chili flavor. Fat Snax Cookies are made with almond flour and sweetened with erythritol and stevia. These are a solid keto treat option for anyone who’s able to tolerate nuts. This variety pack includes their Chocolate Chip, Peanut Butter, and Lemony Lemon flavors. Eating Evolved’s Keto Cups are my go-to road trip treat! I LOVE the coffee flavor. A bag of either the original or coffee would make a great stocking stuffer or addition to a gift basket. Veggicopia makes delicious, shelf stable, minimally processed green olives in single serve bags. They are seasoned with extra virgin olive oil and salt for a perfect, simple, grab and go snack to keep on hand! These are perfect for stocking stuffers, or a keto care package! This Avocado Pop Socket is just the cutest! Definitely the perfect gift under $20 for any keto or low carb eater that loves their gym selfies or sharing photos of their food to Instagram. People, this thing is LIFE CHANGING! So many people don’t use their cast iron pans enough because cleaning the pans is a pain. Maybe you’re not even sure how to properly clean a cast iron pan to begin with! Enter The Ringer Cast Iron Pan Cleaner. We have had one of these since they came on the market, and can confirm that it’s non-rusting, super durable, and worth every penny! An instant-read digital thermometer is essential for cooking meat properly! I like this one because it’s waterproof and has an auto-off function. Food 52 has a fantastic article about why foodie hipsters love to hate garlic presses, but I’m very firmly on the opposite side of that argument. It wasn’t always that way, however. I am a classically trained chef, after all! I used to be a diehard fan of just crushing cloves under a chef’s knife and then mincing them. I was proud to eschew a tool Alton Brown would probably call “a uni-tasker”. But once I let go of my ego and gave the garlic press a chance, it completely changed my mind. This garlic press produces a superfine garlic paste that virtually melts into whatever I’m cooking. Most importantly, my hands don’t constantly smell like garlic anymore! I love, love, love my OXO Good Grips Garlic Press because it’s so simple and easy to clean. A microplane is absolutely essential for everything from freshly grated nutmeg to citrus zest. It also happens to be the perfect size and shape for fitting into a Christmas stocking! This is the one we use and love in our kitchen. I absolutely LOVE Stanley Adventure Travel Mugs for three reasons. First, they do double duty as a hot or cold travel mug, which saves space in my cabinet. Use it with the straw for cold drinks or without the straw for hot drinks. Second, these mugs keep drinks either hot or cold for an insanely long time. I often end up leaving it in my car on hot days and the ice inside doesn’t melt. In the winter it keeps my coffee hot all day long while I’m at the ski lodge. The third thing I love is the lid. You know those super complicated lids with 7 pieces that you can never remember how to reassemble? This is NOT one of those – there’s nothing to take apart and it’s super easy to clean in the dishwasher. The Stanley Adventure Mugs come in 20oz, 30oz, and 40oz, but I obviously love the 40 oz since it holds more COFFEE! Many keto recipes use low carb vegetables as a substitute for noodles and more! This mandolin slicer is super handy for quickly producing those thinly sliced vegetables. We use ours all the time to slice zucchini and yellow squash into “noodles” for recipes like lasagna and Beef Stroganoff. Mandolins can be dangerous to use, so I love that this mandolin comes with cut proof gloves! Every keto baker should have a good set of metal measuring spoons and cups. 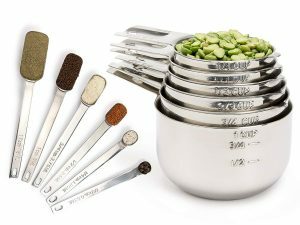 Metal measuring spoons and cups last much longer than plastic, and the measurements are engraved on the handle, so they will never wear off (a recurring problem with every plastic set I’ve ever owned!). I highly recommend a set with elongated spoons like these to allow them to fit in more spice bottles! This Lily’s Chocolate Six Pack includes three flavors – Creamy Milk, Salted Almond & Milk, and Almond. Lily’s is one of the few commercially produced chocolates that is truly keto and low carb friendly, with no maltitol. These stainless steel scoops are another essential pro item every home baker should have. Use the scoops to perfectly portion your cookie dough, cupcake batter, biscuit dough – anything you can think of! Trust me, you’ll have MUCH more consistent baking results this way. I recommend buying the Vollrath set of three different size scoops. The best way to succeed on keto while also saving money is to plan ahead and pack your lunch. But for someone who works outside the home or is in their car all day, that can be limiting without a microwave available. A couple of years ago I discovered the wonders of multi-compartment hot AND cold insulated lunch bags. You can bring a serving of hot, leftover low carb casserole in one compartment while keeping a salad cold in another compartment! And these dishwasher safe, leakproof glass two compartment containers are the perfect addition for anyone getting started with weekly meal prep. We are self-admitted total coffee snobs, and we have probably owned ever different type of coffee maker – Aeropress, Chemex, Nespresso, you name it! Imagine our surprise when we tried the Ninja Coffee Bar two years ago and LOVED it. There has never been a coffee machine that has lasted that long on our kitchen counter! We love the different brew sizes and types, even if we did make fun of a few of the names at first (Rich Brew, I’m lookin’ at you!). I recommend gifting the model that includes the glass carafe so it’s easy to make a large pot when friends visit. In the words of my husband, coffee grinders are serious business! The Baratza Encore Conical Burr Coffee Grinder is the best value coffee grinder for making pour-over coffee because of its consistent, even grind. If you want to impress a keto coffee lover, this gift is a fantastic choice. A Le Creuset Dutch Oven is an impressive gift for any keto cook, and I love the 5.5 Quart size for its versatility. Le Creuset Dutch Ovens are perfect for braising meats – we use ours for low carb beef stew all the time! We have the Marseille Blue (gorgeous!) but the Cherry Red would be so festive as a Christmas gift. The MagiMix Food Processor is the food processor to have in the kitchen. It’s manufactured by the same company that makes the workhorse Robot Coupe food processors found in EVERY commercial restaurant kitchen. I’ve been using my MagiMix for several years and highly, highly recommend it. Good knives are absolutely essential. If you’re looking for a show-stopping gift that will actually be used, you can’t go wrong with the Wusthof Classic Ikon 14 Piece Knife Block Set. Unlike a lot of smaller sets, this set truly includes EVERYTHING a home cook needs. The ergonomically designed handles are perfectly balanced and the set comes with a gorgeous knife block (choose either Acacia or Walnut). I’m a huge fan of Wusthof knives for their quality and durability. I have Wusthofs that are still going strong after nearly two decades of daily use!